*Are you a SESCO retainer client? 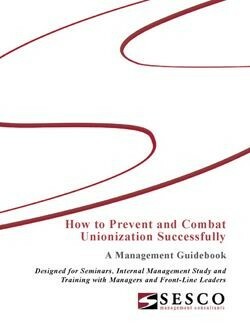 The purpose of this manual is to provide your organization with tools and advice based upon our 65-year history in successfully representing employers when presented with the possibility of unionization. SESCO expects an increase in labor activity based upon the promises made by Democrats recently elected to include the White House and both the House and Senate. Additionally, labor unions have redoubled their efforts to pass the deceptively entitled "Employee Free Choice Act", legislation that would all but eliminate secret-ballot elections in union organizing campaigns in favor of a card check process. Unions are using the Internet to mobilize their members and lobby key senators. They have launched a hard-hitting campaign to discredit the National Labor Relations Board (NLRB), the federal agency that oversees secret-ballot elections in union organizing drives. And they poured hundreds of millions of dollars into the 2008 elections and therefore recently elected officials owe favors to "big labor" for their support.